I mentioned the Sound City movie in yesterday’s email. Here’s a great quote from the movie. It’s Mick Fleetwood (Fleetwood Mac), talking about the new “digital age,” where the technology allows folks like you and me to make music in your bedroom studios. Raise your hand if you’re guilty of being a “studio hermit,” locking yourself away in your studio for hours on end, with no human interaction. But Mick is 1000% right. Music was meant to be made by groups of people. How can you incorporate that idea into your studio? I don’t want to program drums anymore, so I hire my buddy Tim to track drums on any projects I’m working on. I don’t need to play bass. My bro-in-law Joel handles that for me. I don’t need to master my upcoming album. I COULD, but I shouldn’t. I’m having Ian Shephard master it. I CAN sing all the harmony vocals on this album, but it would be much better (and a TON more fun) to take the time to coordinate with a group of singers and have a big vocal session with a bunch of people. In what areas are you doing things yourself, when it would be much better to involve somebody else to open up the creativity? For example, maybe you’re not a good singer, but you keep singing on all your recordings. Now’s the time to find someone to do the singing for you. That’s just one of a bajillion examples. Take Mick’s word for it. Making music in a bubble is less than satisfying. Involving other people will always involve more work, but it will also be infinitely better than the alternative. 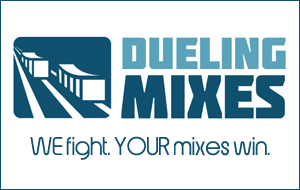 And hey, if you want a group of people to help you as you try to improve your mixing skills, then there are several hundred members over at Dueling Mixes who are dying to meet you.